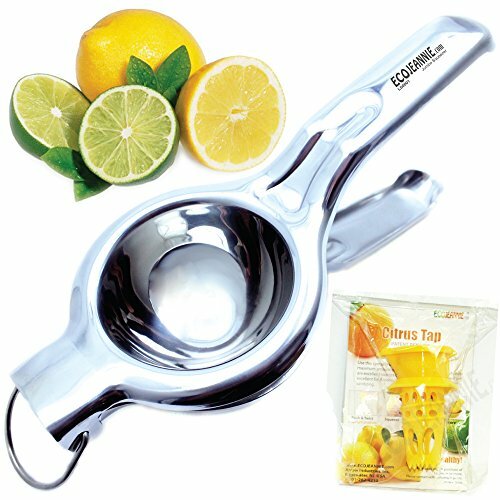 Best Seller Top Selling Stainless Lemon Squeezer /// Bestselling Manual Juicer in Its Class -- EcoJeannie Jumbo Lemon Squeezer is made of high quality #304 Stainless Steel in mirror finish in professional and jumbo size. From material to construction, this is the best lemon squeezer you will ever find. /// Durability and Convenience -- Thanks to superior material (#304) and commercial grade construction, this will neither break nor rust. And, there will not be any leaky liquid from handle. Can be washed either by hand or dishwasher. /// Jumbo Sized -- Generous size makes juicing so much fun and easy. Simply cut fruit in half, and place it cut-side down in the bottom bowl of squeezer, and squeeze the handle. You will be able to squeeze maximum juice out of fruit in a way that you never imagined possible. --- If you need an even bigger Squeezer, please check our new EcoJeannie LS0002 Super Jumbo Lemon Squeezer (You can simply copy and paste EcoJeannie LS0002 in search box.) /// Live Customer Service -- If you call us, you will helped by one of our knowledgeable sales associates who can help you with any variety of issues. /// We Stand by Our Products --We stand by all the products we sell. 100% Lifetime Satisfaction guaranteed or your money back. No question will be asked. Just let us know. We will even pay for return postage. BIG AND STRONG : Professional and jumbo size, made of high quality #304 Stainless Steel. This is the strongest lemon squeezer you will ever find. DURABILITY : Will never break, Will never rust, Dishwasher Safe - Guaranteed ! EASY TO USE :Simply cut fruit, and place it cut-side down in the bottom bowl of squeezer. You will be able to squeeze maximum juice out of fruit. LIFETIME GUARANTEE :Total Satisfaction Guaranteed or your money back. Just let us know. No question will be asked. If you have any questions about this product by EcoJeannie, contact us by completing and submitting the form below. If you are looking for a specif part number, please include it with your message.